With the presidential inauguration bringing plenty of people into Washington D.C., RIM decided it would set up a tent in conjunction with the Canadian Embassy. 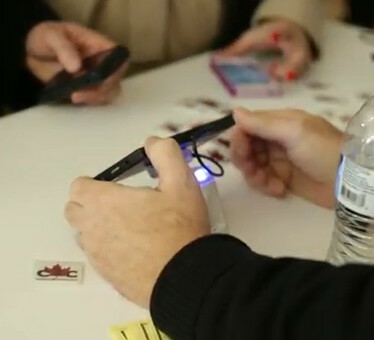 The idea was that users could come in the area and test out BlackBerry 10 on the BlackBerry PlayBook. Why not give them a BlackBerry Z10 to test? Somehow, we could see that turning into a PR nightmare for RIM with Mr. Blurrycam and his whole extended family (Mr. Badcrop, Granny Lowflash, etc.) taking pictures of what is supposed to be top secret until next Wednesday. 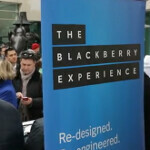 On the other hand we're not certain that the experience portrayed BlackBerry 10 as it should. Since the video below is made by RIM, you are not going to hear a discouraging word. What you do hear is raves about BlackBerry Balance, which allows you to have one for work and play. At work, certain apps can be used while others cannot, and your company's IT department has some control over the phone. But shift into play, and you have complete freedom. The word correction system also received some praise. We've seen how a suggested word shows up on the virtual QWERTY where it can be swiped into a message. The smoothness and responsiveness of the OS was also receives special attention. Things are falling into place and unlike other handset manufacturers, there actually seems to be a real live buzz around BlackBerry for the first time since the BlackBerry Storm was set to become the first touchscreen 'Berry. But this time, it looks like RIM has cooked the software just right for the launch. i have a blackberry bold 9900 and am definitely upgrading.. #BlackBerry10Believe!! just amazing!!! i really want one badly!!! i love all the features!! very very lovely! and its AWESOME!!! "Since the video below is made by RIM, you are not going to hear a discouraging word;" they must have taken that cue from that "other" company in Cupertino that fabricates their own "control study" promotional videos. BlackBerry should take it to the street: Union Square (NYC), Times Square (NYC), Poydras (next Sunday, February 3rd), etc - to see what people [really] say. Nevertheless, good luck RIM I sincerely hope you can drag yourself out of that volcano you've been stuck in since 2007. Everything they mentioned in this video cannot be achieved with an Android. I haven't really been following blackberry. I just wanna know why I should wait on this instead of getting on of the many Androids on the market today?